You'll handle them like a pro in no time. Puzzlers featuring the familiar format of clearing out a wave of blocks, shapes, jewels, tetrominoes, bits and who knows what else have graced every gaming console known to man. As a species, we seem to be helplessly attracted to the idea of removing things before they pile up too far or reach the end of the line. Thankfully, the DSi Shop has already been feeding our thirst for puzzle games of this kind with blocks and bits, and this now shining, brightly colored balls also grace the DSi Shop in Teyon's Ball Fighter. 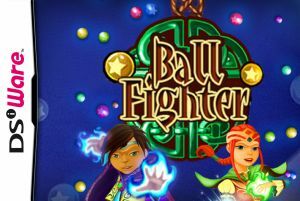 Another ported PC game originally released by partner company Destan Entertainment in 2006, Ball Fighter (like Teyon's first DSiWare release, Robot Rescue) features the same gameplay as the original PC version with completely overhauled graphics for the DSi. 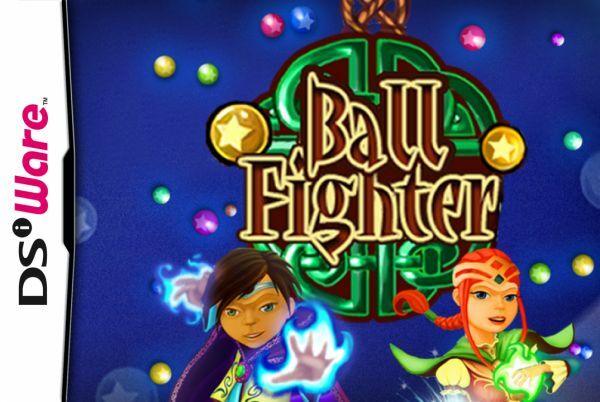 Will Ball Fighter feed our need for object obliteration, or will it fail to catch our interest? According to the graphics, you are some sort of wizard with the magical ability to call colorful spheres to hand. These spheres gradually creep their way down the screen toward you, and if they reach you at the end of the line, the game is over. The idea is to gather up spheres of the same color into your hand with the D-Pad and/or buttons (depending upon which mode you're playing in and what settings you choose) and send them shooting back out at the oncoming stacks. Line up at least three spheres of the same color vertically and they'll disappear, allowing you to grab more spheres and make those disappear, and so on and so forth. For your 500 Points you get three solo and two versus modes to choose from: Arcade, Survival, Brain Breaker, Player vs. CPU and Player vs. Player. Once you've chosen a mode with your stylus, next choose your settings for the round. In the normal one-player modes, you may choose between using one screen for the playing area (with the DSi held on its side, like a book) or both (the DSi is held normally), and also one of three speeds at which the stacks of spheres will make their way down the screen. Brain Breaker mode only allows you to choose your speed option, and the versus modes allow you to choose which screen to play on, the intelligence of the CPU and whether to enable combos (to throw extra balls into the opponent's field of play). Whichever mode you choose, once you've got your options set, you're ready to play - but the game is not. The game spends about five to eight seconds putting each round together while showing you a plain black-and-white loading screen. There are other transition points where the screen flashes to the loading screen briefly before moving on as well. Waiting of any kind is boring, but why Teyon spent so much time revamping the game's original graphics and neglected their loading screens is a mystery. Also, the explanations for everything that were so helpful in Robot Rescue are conspicuously lacking in this game; a tutorial would definitely have been nice, as it wouldn't require the player to muddle through the obviously translated manual to learn how to play. Once you're in and past the somewhat steep learning curve, the game itself is rather enjoyable. A line of white dots extends from your hand at the bottom of the screen up to the wall of balls as it descends upon you, showing you which particular sphere you'll call down by pressing Down on the D-Pad. You can only hold spheres of one color at a time, but you can continue to grab as many spheres of that color as you like by moving around with Left or Right. 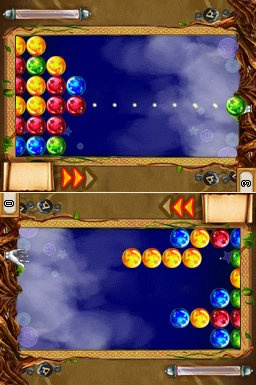 Pressing Up will launch those spheres from your hand back onto the playing field, and as mentioned before, if you stack three or more of them on top of one another, they'll vanish along with any other like-colored spheres that may be touching the vertical stack, so you can rack up combos with some skill. Sometimes balls with little treasure chests inside will appear within the descending wall which, once destroyed, will give you one of three special bonus items to help you in your ball-eradicating quest. 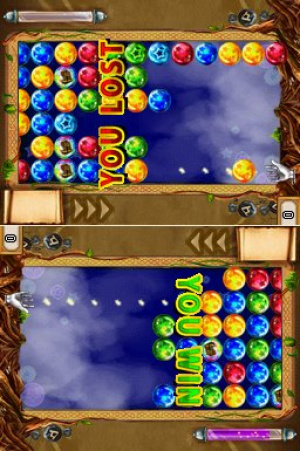 You can only have one bonus available at a time, no matter how many treasure balls you eliminate, so don't be afraid to use them whenever you like with L or R (while using a single screen to play, L fires the bonus on the bottom screen and R fires the bonus on the top screen). Select pauses the game and Start gives you the option to end your game in progress. In the Arcade, Survival, and Brain Breaker modes, you play for points. Arcade mode has you eliminating a set amount of spheres in order to advance through each level. In Survival mode, the idea is to keep playing for as long as you can. Brain Breaker mode, however, truly lives up to its name - in this mode, you operate two different Arcade style games at the same time. The lower screen is controlled by the D-Pad, and the upper screen by the DSi's face buttons (they behave the same as the D-pad in this case, with the direction pointing toward the hand acting as Down). Each screen earns its own bonuses by eliminating treasure-balls, L firing on the top screen and R firing on the bottom. Only by carefully coordinating your sphere-handling skills will you get far in this mode; though daunting at first, even the least ambidextrous gamers will get the hang of it with practice. Once your game is over, if you reached a high score you're given the opportunity to input your name, and all three high score tables may be viewed at any time by choosing High Scores on the main screen. After exiting out of the High Score list, you're back at the main screen, ready to set your options and wait for your game to load all over again. The versus modes allow you to choose which screen you'd like to play on, upper or lower, and the idea is to destroy stacks of the colored orbs more quickly than your opponent, whether human or CPU. For every stack eliminated, one ball or more is added to your opponent's stacks, sending them ever-closer to the end of his or her line. Successful combos will increase the amount of balls added to your opponent's wall, but you have the option to turn combos off in order to even the playing field against a combo-creating king or queen. Player vs. Human, surprisingly enough, does not take advantage of the DSi's Download Play feature - rather, you and your opponent share one DSi in order to play. The controls work like Brain Breaker mode, except with one screen intended for each player. It's an interesting idea for versus play, and it eliminates the need for two separate consoles, but hopefully you're playing against someone who put on their deodorant for the day, as you're going to be very close during the game and things get pretty tense. You may also find yourselves in a mini tug-of-war as you each angle for a better grip on the DSi or a better view of the screens. After each round of one of the versus modes, you're immediately asked if you'd like to play again, thus skipping the options screen and loading times you're forced to go through over and over while playing by yourself. It would have been nice to have this feature for the single-player modes as well. Like Robot Rescue before it, the graphics in Ball Fighter have gone from 3D to 2D and, aside from the aforementioned 'loading' screens, Teyon did a decent job slapping together a mystical theme involving Celtic knotwork, random runes, scrolls and, of course, creating the wizard and witch to grace the title screen with their glowing, sphere-grabbing hands. 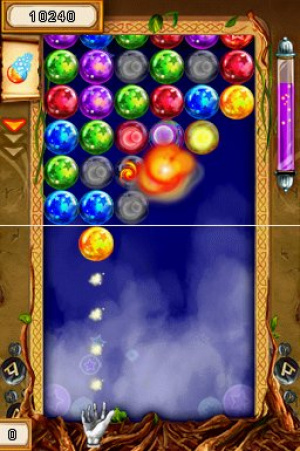 The spheres themselves are all very bright and distinctly different from one another, so you'll have no problems stacking them up, and the dots indicating which stack of spheres you're actually drawing from is a gigantic help, especially when playing Arcade or Survival mode on two screens. 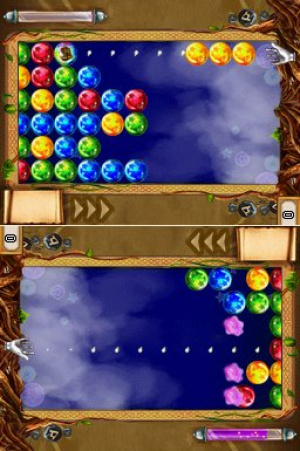 That said, be aware that Ball Fighter also has the same 'no gap' issue that Robot Rescue had; as soon as one ball disappears from one screen, it appears on the other. It's nothing major, but it'll take some getting used to, and you do have the option to play on only one screen if it's too big a distraction. The music for the main menu is laid back and pop-ish, making heavy use of synthesized instruments, but you may recognize the track that plays during the game itself - it's a mix of the title theme from Robot Rescue. While it's not a bad thing, and it's certainly not elevator music, it brings a space-y vibe to the game that seems out of place with regards to the visual theme of magic and mysticism. You'll probably be too focused on the gameplay to really care about the music, though, and all of the pings, fanfares and other sounds combine to make this game pleasing to the ear overall, even if it doesn't quite mesh with the overall theme. If you don't like the music or sound effects, be prepared to lower the volume on your DSi, because there's no main 'options' menu available to adjust the in-game volume. Overall, Teyon made an excellent choice by porting Ball Fighter to the DSi. Behind the thrown-together theme, misplaced music and the name that sets the five-year-old in all of us giggling lies a solid, entertaining puzzle game that would be great no matter how it looks or sounds. Versus play is awkward against a human, but the option to play against the CPU is also available, and while the intermittent loading screens may become annoying the game itself is addictive enough to have you waiting eagerly for your next fix to load. There's no tutorial, and the oddly-worded manual may throw you off, but if you're a fan of puzzle games and you'd like something new to play, definitely give Ball Fighter a shot. I may look into this game soon. Thanks for the detailed review. Think I'll download this soon. cool, i may give pop island and this one a try if i get more points this weekend. That is truly the funniest tagline ever. I got this game, but to be honest i dont really like it. Great review though. Got it tonight, liking it so far!